Print your own Halloween mask. It’s fallÂ and our thoughts turn to that important question, “What will I be for Halloween?” Here’s an idea: makeÂ your own unique, inexpensive Halloween mask by following these simple steps. The possibilities are endless. 1. 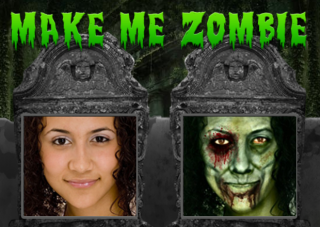 Take a picture you like.Â You might be a celebrity, your best friend, or you could run your own photo through one of two free zombiefiers here:Â greenishÂ orÂ ghoulish. 2. Design your mask.Â You may cut it above the mouth to leave the jaw free as in the photo above, or it couldÂ cover the mouth. Use a string to measure yourÂ face: if youÂ intend to wrap the mask backÂ toward your ears, the mask may be wider than it is tall, so you would print the 8×10 in landscape mode.Â dotphoto’s editing tool can change your cropping orientation. 3. Print the photo as an 8×10Â onÂ matteÂ paper. Glossy paper would be reflective, so would not work as well. The mask only needs to last for a night, and 8x10s at dotphoto are only 99 cents, so you might make two or three prints of different sizes, plus a backup. 4. Cut the eye and mouth holesÂ with anÂ Xacto knife, and cut around the edges of the face. 5. Attach ribbons or a strap to hold the mask in place.Â Before cutting the strap holes on the sides of the mask, add clear tape to both sides to reinforce the holes. String and a rubber band make a good strap that can be adjusted by knotting the rubber section. Want help setting up the photos for your mask? Add your photo to an album in your account called Halloween mask, and send a note toÂ mask@dotphoto.comÂ with your request. Please include as much information as possible — especially size.